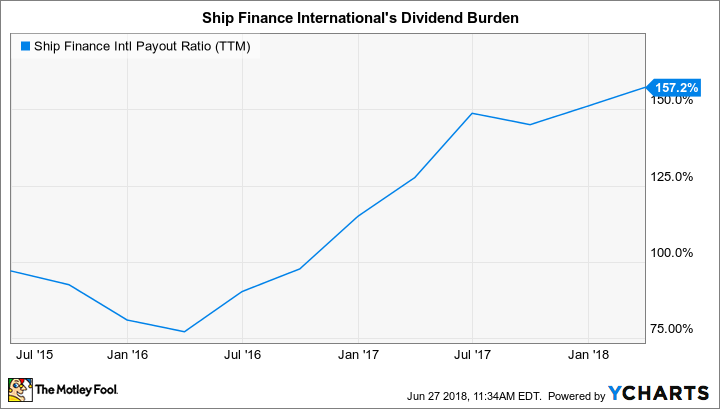 The shipping conglomerate's dividend payout ratio has spiked in recent months. Ship Finance International Limited (NYSE:SFL) has paid out 57 consecutive dividends going back to 2004, and for the last five years, its dividend yield has floated around 10%. As of this writing, the $0.35 quarterly dividend per share yields 9.3% annually at the current share price. But might this stable and attractive distribution get curbed in the near future? The company's dividend payout ratio has spiked uncomfortably over the last year and a half, and payouts recently surpassed 150% of net income. SFL Payout Ratio (TTM) data by YCharts. Last year, net income dropped from $146.4 million to $101.2 million, creating the sharp trend line seen above. The 2017 earnings dip can be traced to numerous factors, including higher interest expense, a reduction in tanker income, fewer ships in the fleet on charter to former parent Frontline Shipping (NYSE:FRO), and the bankruptcy filing of Seadrill Ltd. (NYSE:SDRL). Seadrill's reorganization has impacted Ship Finance's offshore revenue, as it has three out of four offshore drilling rigs on charter to affiliates of Seadrill. Image source: Ship Finance International Limited. Net income, however, might not be the best way to gauge the company's ability to keep cutting its handsome dividend checks -- shareholders should probably also consult adjusted EBITDA. Now, I'm not a huge fan of using earnings before interest, taxes, depreciation, and amortization as a proxy for cash flow when EBITDA itself is then adjusted further. But in some cases, using this modified metric to understand cash flow strength makes sense, and it does here. Take the company's depreciation and amortization expenses. They're quite high, but not out of line for the shipping industry, given that the company routinely invests in heavy ocean vessels. In the first quarter of 2018, depreciation and amortization expense of $22.3 million was almost as much as the company's GAAP net income of $24.6 million. Similarly, Ship Finance's ongoing investments in liners, tankers, rigs, and dry bulk vessels mean that it typically carries a significant amount of debt on its balance sheet. Interest expense in Q1 2018 came to $20.9 million. Thus, depreciation, amortization, and interest expense together represent some $43.2 million of non-cash charges against net income. In addition, Ship Finance makes certain adjustments to EBITDA to account for cash flows received from its investments in subsidiaries which lease its vessels. Per GAAP, a portion of these cash flows are deemed as repayments of finance leases, so they don't hit the income statement, but instead, they adjust the investment account on the balance sheet. In sum, Ship Finance's adjusted EBITDA in a single quarter can vary significantly from net income. In the first quarter of 2018, adjusted EBITDA of $100.0 million represented cash flows that were roughly quadruple the size of net income. Last year, total adjusted EBITDA of $468.2 million was more than enough to cover debt repayments of $179.3 million, as well as $152.9 million in cash dividends issued. Looking forward, recent enhancements to the company's fleet point to higher EBITDA -- and higher net income -- opportunities ahead. Ship Finance announced during the first quarter that it's acquired 15 feeder size (i.e., small size) container ships chartered through 2025, which will add another $5 million in EBITDA per quarter. Additionally, the company acquired four "modern design eco-container ships," with carrying capacities ranging between 13,800 and 14,500 TEU (20-foot equivalent unit, a standard container size). These larger class container ships are expected to add another $15 million in EBITDA per quarter at long-term charter rates. Management hasn't yet disclosed the purchase price on either of the transactions. The feeder vessels were acquired with cash on hand, while the larger ships were purchased using an unsecured, short-term loan from an affiliate of privately held Hemen Holding Ltd., one of Ship Finance's larger shareholders. Management has indicated that it will convert the feeders to a financed position of $50 million, and has confirmed that the Hemen Holding loan totaled $320 million. So, shareholders know that interest expense associated with at least $370 million of debt on the new vessels will soon hit the books. But the EBITDA projections imply that, overall, these capital acquisitions will have a positive impact on net income. It's reasonable to assume that Ship Finance Limited has ample cash flow to continue to its long streak of high-yielding shareholder payouts. A slowly improving global economy, and increasing dry bulk shipping rates, bode well for long-term charter revenue. And within Seadrill Ltd.'s court-approved reorganization, Ship Finance has agreed to take a significant but manageable 29% charter revenue haircut on its three drilling rigs until 2023. At that point, the reductions will be added back to future charter rates. A reduction in EBITDA of roughly $14 million per quarter from the agreement has essentially already been replaced -- by projected income from Ship Finance's new vessel purchases.